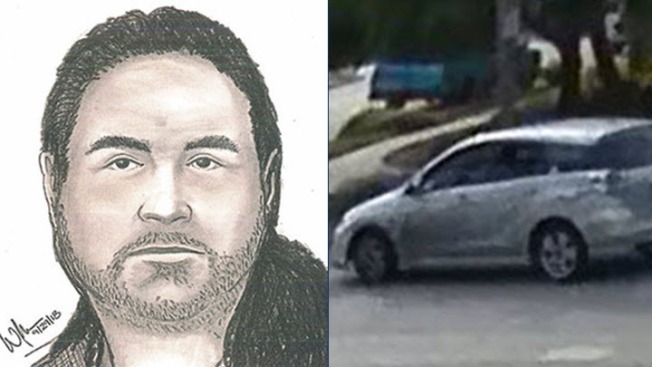 Sketch of a suspect and photo of a suspect car in three indecent exposure incident in San Jose. Police in San Jose are searching for a suspect in three indecent exposure incidents in the Parkview Park area of the city, according to the department. Between Sept. 25 and Oct. 15 during the late afternoon hours, the man has approached victims while driving his vehicle, police said. He pulls to the side of the road, engages the victims in conversation and then exposes himself before driving away, police said. The suspect is described as a Hispanic or Samoan male, 20-39 years old, with a medium to heavy build, black or brown hair in a ponytail and a thick black or brown mustache and beard. He was last seen wearing a two-tone shirt, dark khaki pants and black wrap-around sunglasses, police said. The suspect was seen in a late model, silver Toyota Matrix or similar style vehicle, with a stylish "M" calligraphy design on the front windshield and several bumper stickers on the rear bumper, police said. Anyone with information about the incidents or others involving the suspect should contact Detective Mark Riles or Detective Tony Vera of the San Jose Police Department's Sexual Assaults Unit at 408-277-4102 during business hours (8 a.m. to 5 p.m.). Dial 911 after hours.